The Common, an arts journal I have contributed to in the past (Jeremiah Dine and Rachel Barrett), recently published this piece I wrote about Martha Willette Lewis. Around the time for the final draft, I shared the piece with Martha and she annotated my work to include quotes and elaborations. While I didn’t include many of them in The Common piece, I wanted to share her insights, quotations and and a brief bibliographic record of influences. You can see Martha’s work in Flat/ Not Flat at Artspace New Haven. Below you’ll find my piece as well as Martha’s notes (italicized). ( an uncertain atlas) ( an atlas of uncertainty)( the unreliable atlas)? ( armchair travels with unreal atlas) ? ( crossing space-time with a sheet of paper)? Rarely are we explorers in the completed cartography of our planet. 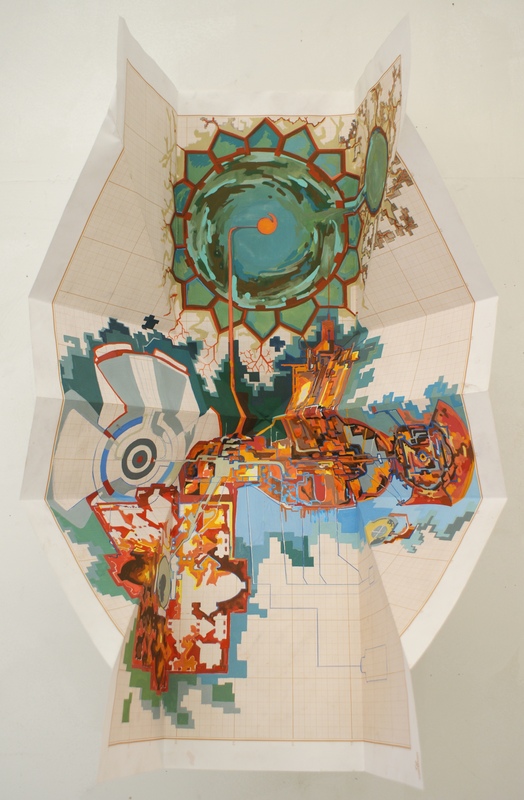 Visual artist Martha Willette Lewis has given us new, unreal spaces to explore by combining diagrammatic drawings, biological systems, and topographical forms. These spaces manifest as works on paper that are often folded, crumpled, or bisected. Lewis takes visual cues from systems that are usually not in contact and, in doing so, creates a skewed sense of reality. Hers is a hybridized vision shared by artists and technological innovators. The paper and drawing are real, but the vision is of an impossible place. Lewis provides a constructed topography for her unreal spaces. 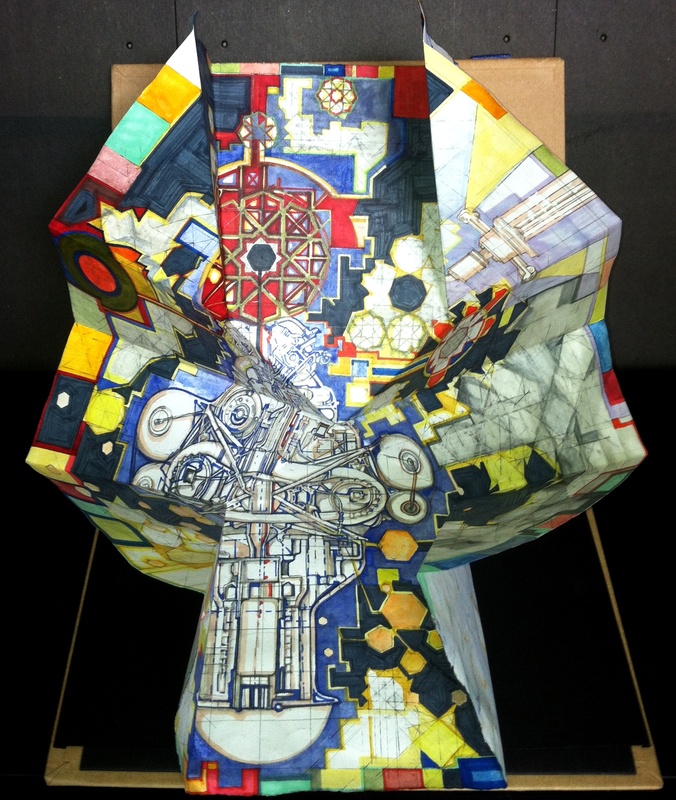 One folded work invoking a map, “Folded Stellar Hive, 2013,” lives as a three-dimensional form. The drawing, like a common map, folds in on itself. In this work, Lewis builds a place for us out of things we recognize, but she creates an amalgam well beyond our possible range of experiences. Filled with color and disorder, the piece’s patterned perimeter begins to yield to the complex forms that mesh within. The geometric forms evoking the spiritual forms of mandalas and rose windows blossom across the paper to build the structure of a hive. (Again, the scale telescopes in and out between the vast and the tiny creating a giddy disconnect as one’s eye ” travels” across the image and the surfaces. The collusion between depicted space and actual fold hint at a meta-discourse on maps as objects in space themselves, and the map as a diagramming of spatial experience which render the giddiness into the strong suspicion that nothing is what it seems to be here.) In “Elemental Reasoning and Limited Resources, 2013,” ancient gothic vaults and swirling pools of deep space bleed into a pixelated grid. An architect or an engineer could attempt to read this as a technical drawing, as it appears factual, and is based on facts, but the result is fiction. 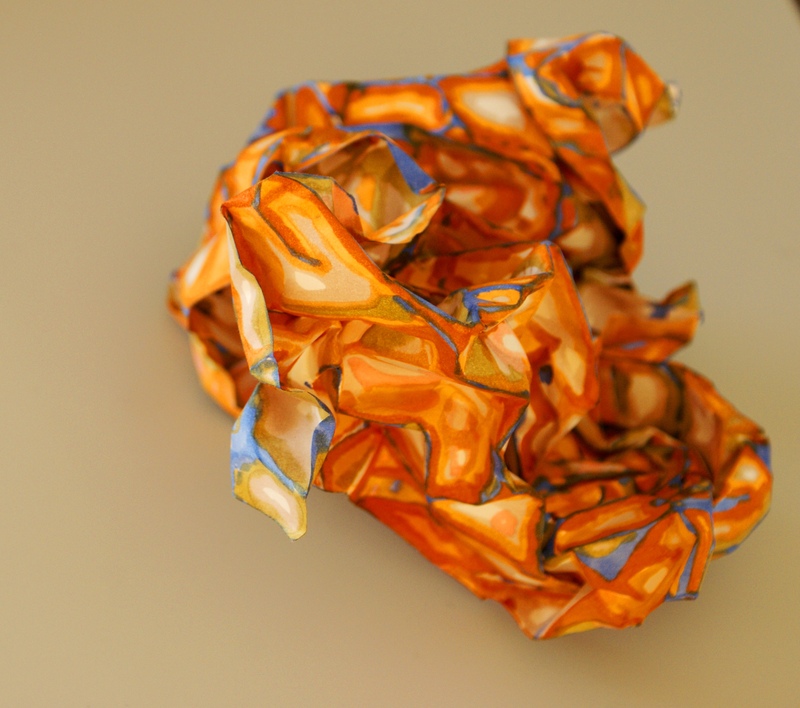 Lewis also creates topographies in painted, crumpled paper. 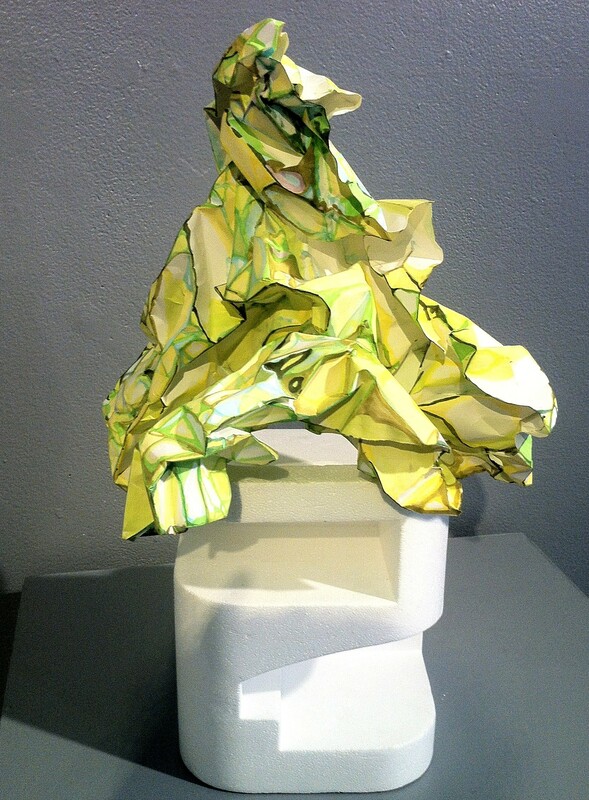 The complexity of these crumpled forms expand imagined space by giving them dimension. Lewis embraces the paper’s weight and volume, and the work’s objectness becomes a physical presence greater than the viewer thought possible for paper alone. Lewis’s works are worlds within worlds and exist as their own tiny satellites.. In “Brane 3, 2013,” the painted crumpled paper form could be a landmass, a brain, the physical cosmology of our universe, or an abstract object. Lewis, a polyglot of various disciplines, intends it to be as all of these. (yet the work hints at all of it. It is telling that the artist thinks of these works more as models then as sculptures). “On Exactitude in Science” or “On Rigor in Science” (the original Spanish-language title is “Del rigor en la ciencia”) , a one-paragraph short story by Jorge Luis Borges, a written in the form of a literary forgery. 2)The Great Pacific Garbage Patch, also described as the Pacific Trash Vortex, is a gyre of marine debris in the central North Pacific Ocean located roughly between 135°W to 155°W and 35°N and 42°N. The patch extends over an indeterminate area, with estimates ranging very widely depending on the degree of plastic concentration used to define the affected area. The patch is characterized by exceptionally high concentrations of pelagic plastics, chemical sludge and other debris that have been trapped by the currents of the North Pacific Gyre. Despite its size and density, the patch is not visible from satellite photography, since it consists primarily of suspended particulates in the upper water column. Since plastics break down to even smaller polymers, concentrations of submerged particles are not visible from space, nor do they appear as a continuous debris field. Instead, the patch is defined as an area in which the mass of plastic debris in the upper water column is significantly higher than average. 3) The great library work that plays on the multiplicity of readings from one place is Italo Calvino’s “invisible cities” in which Marco Polo tells the great khan tales of the places within his empire when in fact Marco is only describing his home city of Venice. Invisible Cities (Le città invisibili) by Italian writer Italo Calvino. published in Italy in 1972 by Giulio Einaudi Editore. 4) The word “serendipity” was invented by Horace Walpole in 1754 as an allusion to Serendip, an old name for Sri Lanka. Walpole explained to one of his main correspondents that he had based the word on the title of a persian fairy tale, The Three Princes of Serendip, the heroes of which ‘were always making discoveries, by accidents and sagacity, of things they were not in quest of ’. Incidentally, the original Persian name for Sri Lanka (and in earlier times Ceylon) was Sarandib, a corruption of the Sanskrit Sinhaladvipa which literally meant ‘the island where lions dwell’. Sinhalese, or Sinhala, is still the name of one of Sri Lanka’s national languages, the other being Tamil.